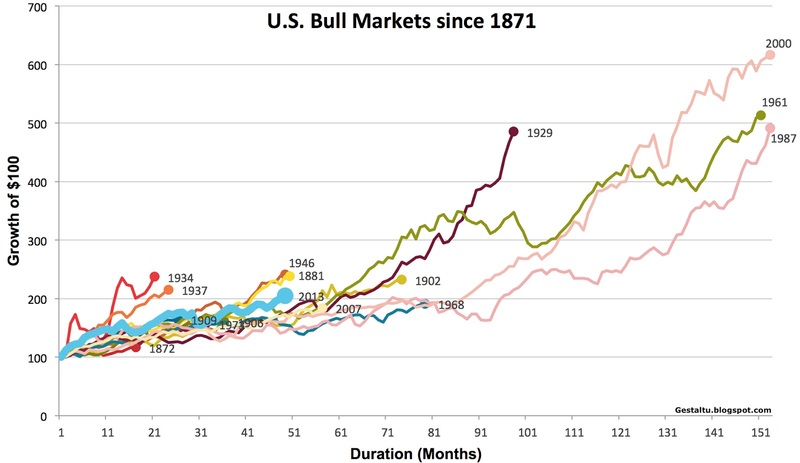 Butler|Philbrick|Gordillo and Associates have an interesting post called What the Bull Giveth, the Bear Taketh Away on the duration and magnitude of all bull and bear market periods in U.S. stocks since 1871. For the purpose of the study below, we examined the S&P 500 price series from Shiller’s publicly available database to understand the duration and magnitude of all bull and bear market periods in U.S. stocks since 1871. We defined a bear market as a drop in prices of at least 20% from any peak, and which lasted at least 3 months. Bull markets were then defined as a rise of at least 50% from the bottom of a bear market, over a period lasting at least 6 months. 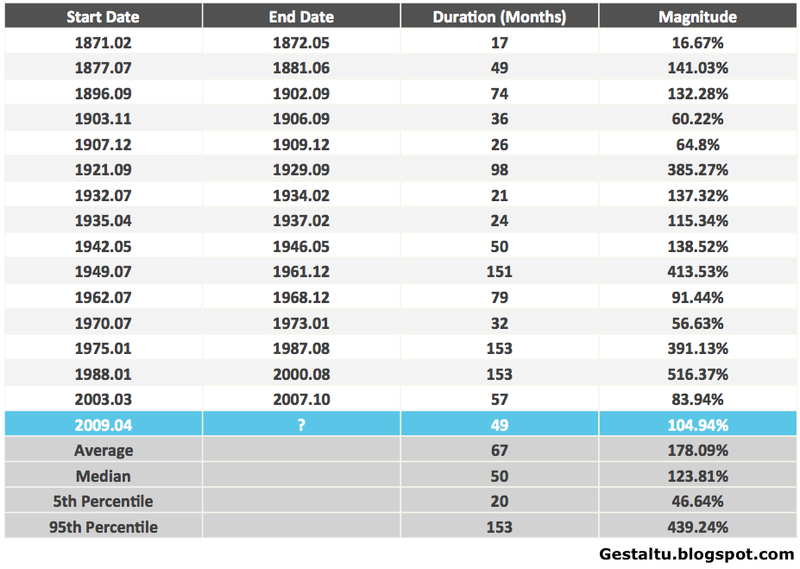 Chart 1 and Table 1 describe every bull market since 1871 in the S&P, including duration and magnitude information. The lesson from this analysis is uninspiring for equity bulls, as we will see. The core hurdle is that the current bull market has (through end of February) already delivered 105% of gains, against the median 124% bull market run through history (using monthly data). Of course, this means that, should this bull market deliver an average surge, investors can hope for less than 20% more growth from this cycle. Further, given that the median bull market has historically lasted 50 months, and we are currently in our 49th bull month, we are about due for a wipeout. The current bull market has already delivered 85 percent of the gains, and lasted about as long, as the median historical bull market. Read What the Bull Giveth, the Bear Taketh Away for the bear market equivalents of the preceding bull table and chart. Butler|Philbrick|Gordillo and Associates demonstrate that, if it follows the median bear market, it will wipe out 38 percent of all prior gains.